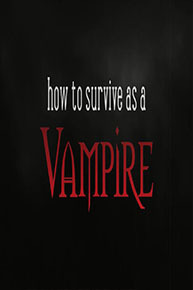 Vampire Beauties: Vampiress Review: "How to Survive as a Vampire"
Vampiress Review: "How to Survive as a Vampire"
This is a short "how to" video showing the rules of how not to die if you're turned into a vampire. The film stars Jazi Jey as the example vampire. In it she shows all the different do's and don't scenario's through acting them out. This film is in the format of a silent black & white film from the days before "talkies". How to Survive as a Vampire from Derian Wall on Vimeo.